This function allows you to adjust your tripmaster according to the information supplied by the rally organization. Tripmeter distance : It’s the value display by one of the dials of your tripmaster having crossed the bad of calibration of the rally organization. The corrected calibration value for your tripmeter. We voluntarily left decimal to estimate exactly the corrective value which you have to apply. The default calculations are realized for a trip master as an VH Trip, that is if your distance to tripmaster is lower than the distance of the zone of calibration, the indication has to increase. 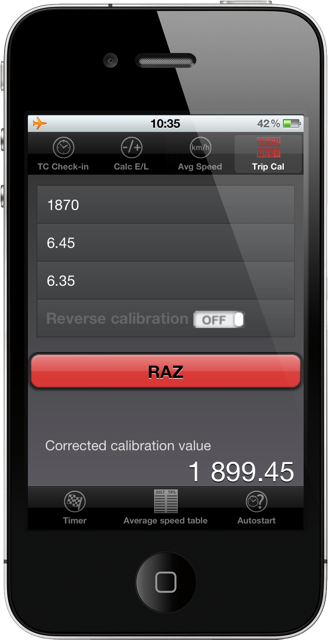 If you use a tripmaster working differently, you have to check « Reverse calibration » to get the right new calibration.